When we deliver and setup the equipment we ensure that everything is set to your height and comfort levels. A completely adjustable, ergonomically designed chair to support the entire body, helping to prevent neck and back strain. Also includes a “Work Table,” to enable the patient to read, write, or work on a computer (if these activities are approved by your physician). The Table-Top unit works well for sitting at the kitchen table or when placed on your lap on the sofa. This portable device is very lightweight and can also be used in a car by placing the equipment on your lap while utilizing a pillow. Used for resting and sleeping comfortably on a bed or flat surface, the bed unit is completely adjustable for a variety of body types and sizes. 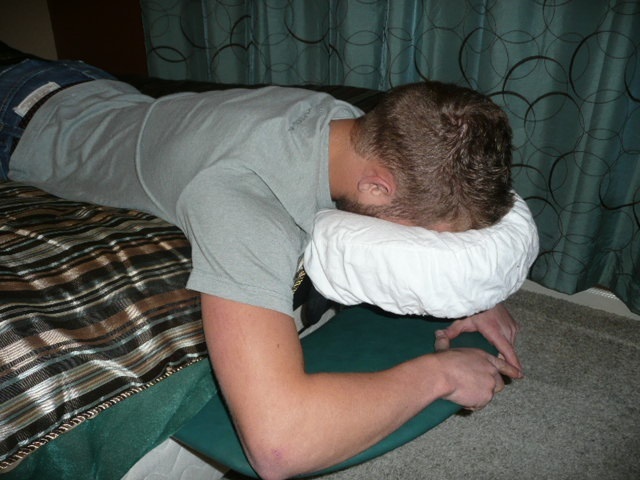 It features a memory foam pad on the head cushion. We show you how to use your own pillows to place under your body for support… No need to rent mats. Remaining face down for 50 minutes is even less of a challenge with the use of this double sided mirror. When sitting on the chair or using the table unit, it allows the patient to keep “Nose to the Toes,” while enabling them to look forward. It works with the rest of the provided equipment, or on it’s own.